The Artificial Intelligence (AI) applications of Fintech content provider AnalytixInsight Inc. (TSXV: ALY – $0.51 & OTC: ATIXF – $0.41 & Frankfurt: 1JX – €0.32) are clearly gaining momentum. The Company is in the midst of a successful rollout of this new technology to a growing client base that recognizes advantages, such faster and more accurate analysis, that contribute to more effective trading strategies. This week the Company reported an agreement with Thomson Reuters (TR) to enable enhanced distribution of financial research reports created using technology developed by AnalytixInsight. The arrangement will establish the Company as a content provider to Thomson Reuters and ensure greater coverage for the smaller and mid-size market cap companies that tend to be featured less frequently. As the largest financial reporting agency in the world, TR operates and distributes content in over 100 countries and is therefore an ideal partner for AnalytixInsight to increase the reach of its reports. TR will include the custom reports and analysis created by AnalytixInsight on the Thomson Reuters Eikon platform, a software portal used to manage and interpret financial data by over 190,000 users worldwide. 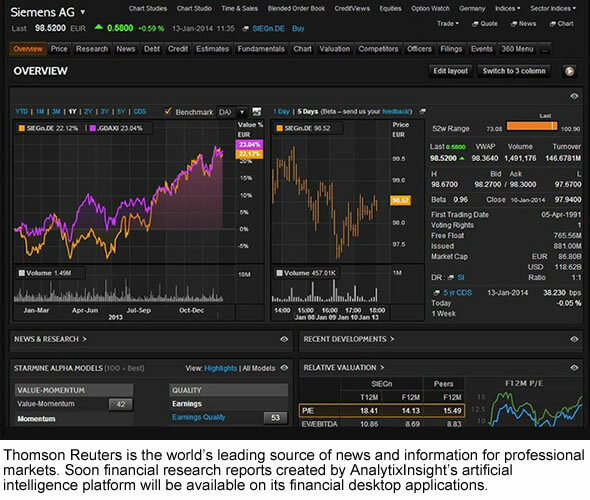 Eikon is the dominant financial content provider in Europe, Africa and the Middle East. This opens the potential to further broaden the geographic coverage achieved by AnalytixInsight beyond its stronghold in North America. This deal will function complimentary with CapitalCube.com, the wholly owned machine learning portal operated by AnalytixInsight using the proprietary platform to create comprehensive research for over 50,000 publically listed and trading companies. In effect, the Company is securing the opportunity to expand its content distribution across a parallel distribution channel with TR, and perhaps build an even greater base of clients that may access the insightful analysis. The two companies are now collaborating as part of the initial development stage to customize the content created by AnalytixInsight and integrate the reports with the existing distribution platform operated by TR. The launch of the arrangement is expected to commence later this year. The strength of this deal is related to the synergies created by the technology. TR has recognized the value of having on demand analysis that delivers accurate information quickly, and for a wider range of companies than was previously available for its client base. This represents another indication of how a new paradigm for financial reporting is being accepted and embraced by the largest and most relevant content providers, to harness AI as part of critical market analysis and company-specific data distribution. When a new disruptive technology is introduced, there is often a lag before it becomes widely accepted and embraced within an established sector, even if there are obvious, significant improvements that are delivered by the new advances. The gradual phase where senior industry players choose to update their business activity and employ the new technology eventually transitions to widespread acceptance as the market adapts to new ways to improve core competencies. For AnalytixInsight, the partnership with the leading financial reporting agency in the world opens up a much larger channel for the distribution of its proprietary content. The relationship with TR is also another significant validation of the quality and accuracy of the reporting generated by the Company using its machine-learning platform. In addition, as the acceptance of AI software platforms for financial reporting and analysis becomes more established, the implied value of the MarketWall business unit will increase. AnalytixInsight owns 49% of MarketWall and the highly anticipated spinoff to a separately listed company, expected in 2019, will most likely contribute to a greater enterprise value for AnalytixInsight when the transaction is completed. Also good to know is that US private equity firm Blackstone Group recently launched a takeover deal valued at $20 billion for the Financial and Risk business unit of Thomson Reuters. Once this deal is completed – expected in the second half of 2018 – this may very well put AnalytixInsight in the spotlight of giant Blackstone, which could lead to a larger client base or even another attractive buyout offer. Recommendation: BUY.